Shark Punching Contingencies: Due to the extreme heat, instances of SPC-3284 are nearly impossible to engage in their natural habitat. The current protocol for dealing with SPC-3284 infestations is to drain the lava lake they are located in, and then move in to punch them while wearing heat-proof armor. For this reason, Mobile Fist Team Sigma-6 ("Flaming Fists of Fury") are to be included in all 3284-related operations. Description: SPC-3284 is a species of silicon-based life form that superficially resemble Carcharodon carcharias. 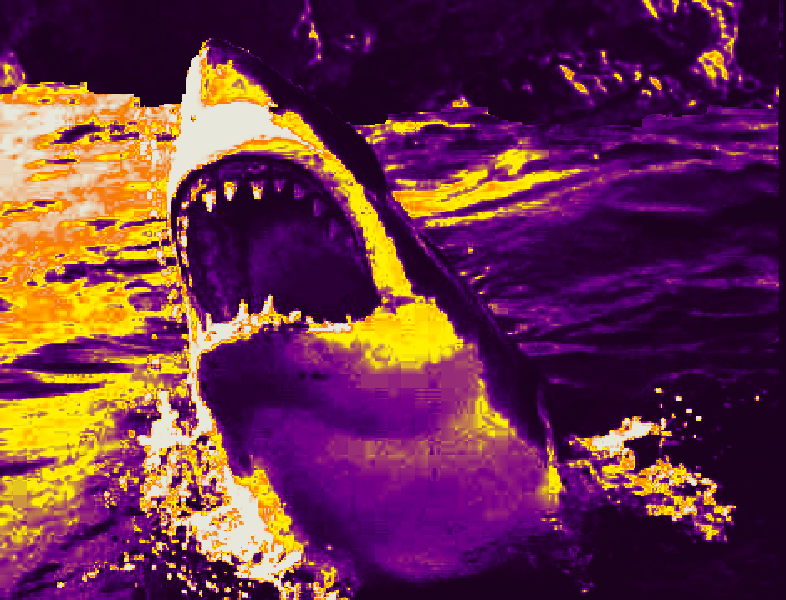 Instances of SPC-3284 typically inhabit bodies of molten lava, and have a unique physiology that allows them to "swim" through it as easily as an ordinary shark swims through water. They do not seem to require sustenance beyond the thermal energy provided by their environment, but will attempt to consume any organic material they can reach. The mechanism used to detect organic material is unknown at this time. SPC-3284 was first discovered during a raid on a Marshall, Carter and Shark Ltd. facility, where they were using genetic engineering and [DATA EXPUNGED] to produce designer sharks to sell to the highest bidders. Using documents acquired from the raid, Center agents were able to track a shipment of SPC-3284 to a lava lake in the Democratic Republic of Congo. Since then, at least █ infestations of SPC-3284 have been discovered, including one in ████████████ National Park. Current research suggests that populations of SPC-3284 annually migrate to new locations through the Earth's mantle. This, combined with their ability to live off thermal energy, may explain why their populations are so widespread. Efforts to drill through the mantle are ongoing.